We all know that interactive projectors can change the classroom dynamic at colleges by allowing students and staff to work together on a digital board and then save every pen stroke to distribute after class. While it can fully digitize the venerable chalkboard without aiming an intense beam of light at the presenter, interactive projectors can be some of the hardest school systems to properly set up and use. Here’re a few tips to get it right on the first try. The biggest decision that you’ll face when installing and using a short throw projector is how to mount it. Unlike a traditional projector that would typically be hung from the ceiling 10 or 15 feet from the screen, the beauty of short throw technology is that it’s set up a few inches from the screen and aims its image up or down at a steep angle. Still, choices abound. In addition to mounting the projector and screen on a purpose-built cart so it can go from room to room as needed, you can hang it from the ceiling, wall or under the edge of a table as well as just set it up on the floor below the screen. They all have their advantages, but the key is to make sure you start with a level projector. If it leans to the right or left, the image will be very difficult to square off. Be ready for some trial and error placement to fill the screen, though. That’s because unlike even the least expensive traditional projectors, few short throw devices have an optical zoom lens to enlarge or reduce the image to frame the screen. By contrast, a short throw projector’s image size is adjusted by moving the projector slightly towards or away from the screen – a delicate task at best. The screen matters as well because it has to act as a solid board to write on. Think about using a painted wall. It needs to be flat, but not necessarily white. That’s because recent short throw projectors, like NEC’s U321H, can compensate for backgrounds that are red, magenta, green, blue, cyan and yellow. Once the image fills the screen and is focused, you’ll likely need to calibrate the pens. This is typically done with an interactive routine that involves taping the pens on a series of targets projected onto the screen. If you’re having trouble getting the pens to work, make sure the projector isn’t near potential sources of electromagnetic interference. Items like a cable TV box or Bluetooth speaker might be enough to throw it off. All set up? Actually, the hard part remains because to get the most out of a short throw projector you need compelling images and video to project and teach with. In addition to going through the school’s online curriculum stash, using interactive elements and perusing YouTube, the latest projectors can help out. For instance, the NEC U321H among others, have built-in overlays that look like lined and graph paper for writing everything from Haikus to teaching Newton’s laws of motion through graphs. Some even add tools like a ruler and adjustable-angle protractor available to help with measuring the angle of molecular bonds or checking the size of a building lot for an urban planning seminar. 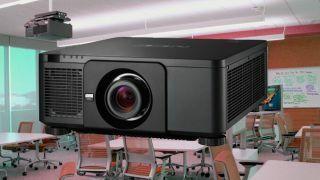 If you do the hard work upfront, the payoff of short throw projectors in higher education is enormous, streamlining education while providing students with compelling in-class visuals, all without blinding the presenter.